Last year Israel abducted 1266 Palestinian children - that's one child taken from their parents every 7 hours! During interrogation 75% of Palestinian children detained by Israel are physically tortured. 40% of the 600 children that were taken from Jerusalem alone, were sexually abused by Israeli soldiers during arrest or interrogation. Today around 300 Palestinian children are languishing in Israeli dungeons secured by G4S and powered by Hewlett Packard IT. These include the five Hares Boys who have been tortured and caged by Israel for 2 years for a crime that didn't even happen; and the 15 years old schoolboy Khaled Sheikh abducted from outside his home. Please join us as we demand freedom for the children. Join the protest outside the headquarters of the British security contractor G4S who secure Israel's notorious torture dens and dungeons where the children are abused and caged. Over the next few days over 50 masked Israeli soldiers with attack dogs stormed the local village of Hares in the early hours of the morning and in waves of violent arrests kidnapped the children of the village. In total 19 children were taken to the infamous G4S secured children's dungeon at Al Jalame and locked up in solitary confinement for up to 2 weeks in filthy windowless 1m by 2m hole in the ground cells with no mattress. The Israeli prime minister Benyamin Natanyahu announced to the settlers that he had “caught the terrorists”. The children were violently tortured and sexual threats were made against the female members of their families in order to coerce confessions from the boys. With the confessions and the new “eye-witness” statements, five of the Hares boys were charged with 25 counts of attempted murder each, even though there were only four people in the car. Apparently the military court had decided that 25 stones were thrown, each with an "intent to kill". The five boys have been illegally transferred to Israel, in contravention of Article 76 of the Fourth Geneva Convention, to Megiddo prison where G4S provides the entire central command room. Hewlett Packard provides technical services and central servers that keep Israels dungeons and torture dens, including Megiddo, operational. In violation of international law Israel has turned prisons in to money making enterprises with the boys essentially forced to pay for their own imprisonment. Israel deliberately fails to provide Palestinian prisoners the basic essentials - edible food, cloths (underwear, shoes..) and hygiene products (soap, toothbrush..). The boys are forced to buy these at the extortionately priced prison shop costing the families over € 125/month to provide for one child's basic needs in prison. G4S provides the security systems, and Hewlett Packard the IT infrastructure, which keep these torture dens operational. Prisoners who have survived these hell holes recall seeing G4S logos on the cameras that witnessed their abuse. These companies are fully complicit in the crimes Israel commits against Palestinian children, and must be held to account. On Christmas day last year Israeli soldiers abducted 15 years old Khaled Sheikh from outside his home in Beit 'Anan in Jerusalem. He has been caged in Israel's notorious G4S secured Ofer prison for over three months now. Israel has denied him any family visits and he has been denied essential medical treatment. Accused of throwing a stone, Israel's military court on 25th February, true to its 99.74% conviction rate, sentenced Khaled to 4 months imprisonment and in addition fined him $500. Khaled suffers from several health issues including anaemia and has been denied his medication since his abduction in December. His family are fearful for his health and are urging activists around the world to intervene to secure the release of their son. 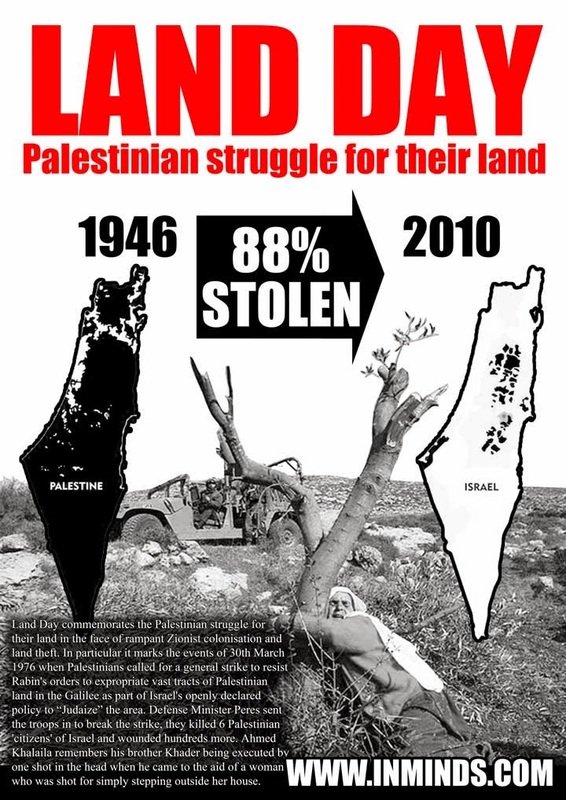 Land Day commemorates the Palestinian struggle for their land in the face of rampant Zionist colonisation and theft of land. In particular it marks the events of 30th March 1976 when Palestinians called for a general strike to resist Yitzhak Rabin's orders to expropriate vast tracts of Palestinian land in the Galilee as part of Israel's openly declared policy to “Judaize” the area. Defense Minister Shimon Peres sent the troops in to break the strike, they killed 6 Palestinian 'citizens' of Israel and wounded hundreds more. Ahmed Khalaila remembers his brother Khader being executed by one shot in the head when he came to the aid of a woman who was shot for simple stepping outside her house. At our protest we will remember Land Day. 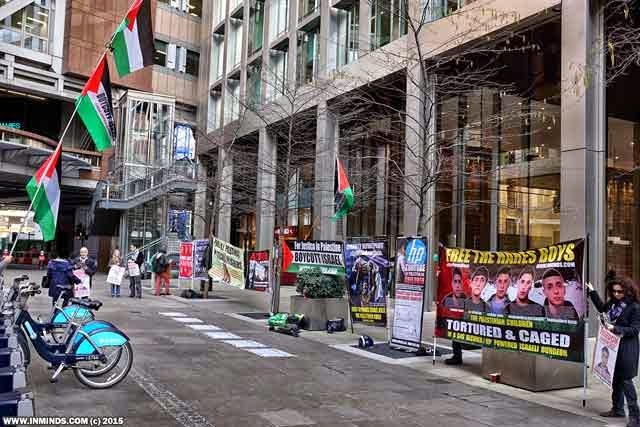 On 20th March we held a second protest for the second anniversary of the abduction of the Hares Boys, this time outside the London headquarters of Hewlett Packard who provide the IT infrastructure and systems that ensures Israel's torture dens and dungeons stay operational.